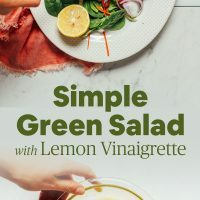 Every cook should know how to make a simple side salad and lemon vinaigrette. It’s the easy side dish to pair with just about any entrée, comes together in 10 minutes with simple ingredients, and is incredibly versatile. Let me show you how it’s done. 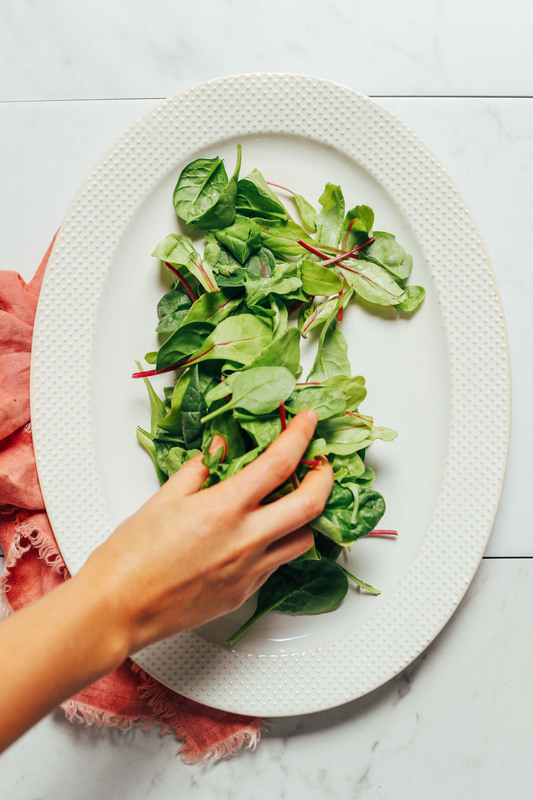 Start with a base of greens. 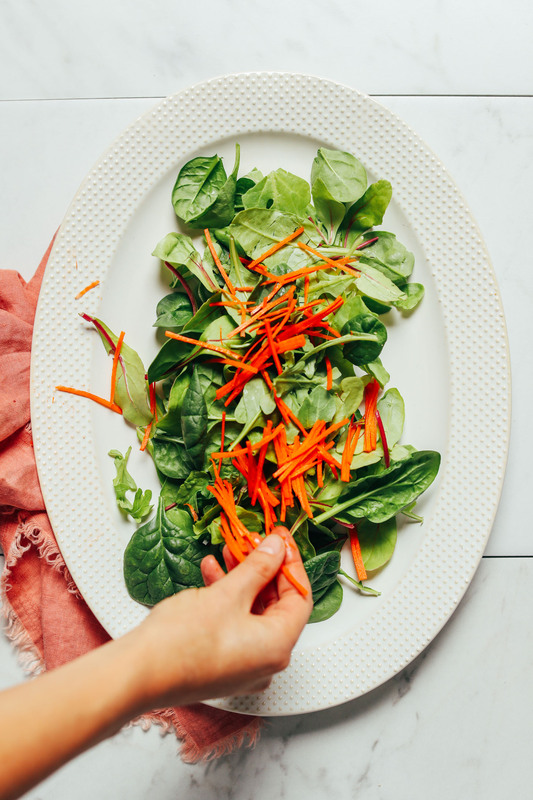 We went with spring greens, but I also love spinach as a base, as well as thinly sliced kale, arugula, and romaine. Next comes any vegetable you have on hand. My go-to’s are finely shredded carrot, chopped tomatoes, and onion or shallot. But to make it a little more fancy, I also included pomegranate arils, cranberries, and pepitas. For even more texture and flavor, you could also consider adding things like my Easy Vegan Parmesan Cheese, Actually Crispy Baked Chickpeas or 5-Minute Macadamia Nut Cheese! Next comes the dressing. 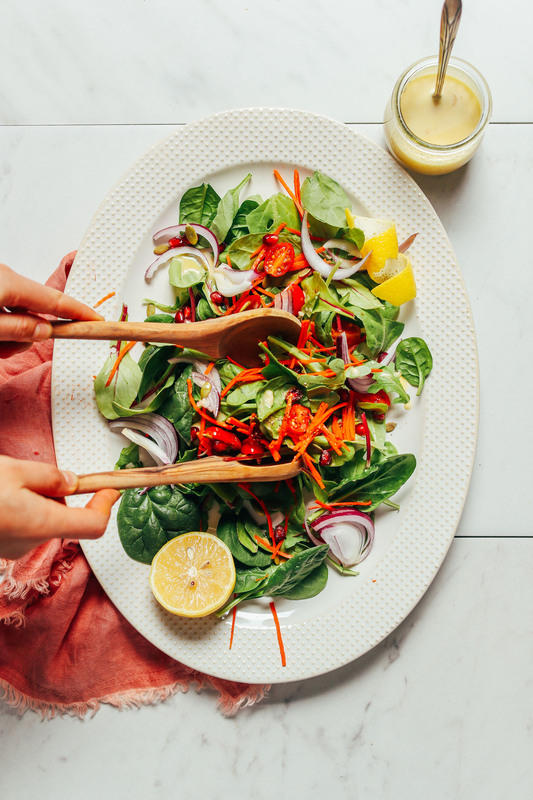 Recipes usually recommend adding twice the amount of oil as acid when making vinaigrette. But I find that makes the dressing taste too oily. So I go for more of a 1:1 ratio for better balance, add a little maple syrup to offset the acidity, and sprinkle with salt and pepper to taste. For even more flavor and texture, you can whisk (or blend) in some shallot. Blending it will add more body to your dressing (making it creamier and thicker). Whisking will be more visually appealing as you can see specks of shallot throughout the dressing. You can pair this side salad with just about any dish. It’s especially delicious with our Smoky BBQ Black Bean Burger, Best Vegan Gluten-Free Mac ‘n’ Cheese, Easy Gluten-Free Vegan Pizza, and Garlic & White Wine Pasta with Brussels Sprouts. 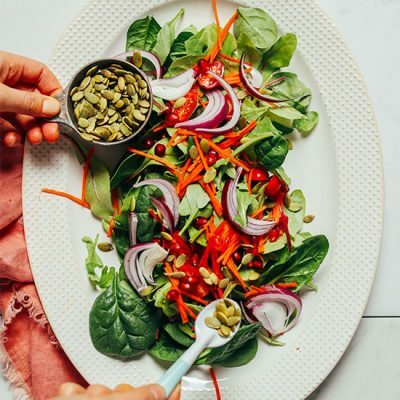 For more salad inspiration, be sure to check out our Sweet Potato & Avocado Green Salad, Roasted Vegetable Salad with Chimichurri, Kale Citrus Salad, Curried Cauliflower Grape & Lentil Salad, or this fan-favorite Garlicky Kale Salad with Crispy Chickpeas. When a meal needs something extra, consider this your go-to side. 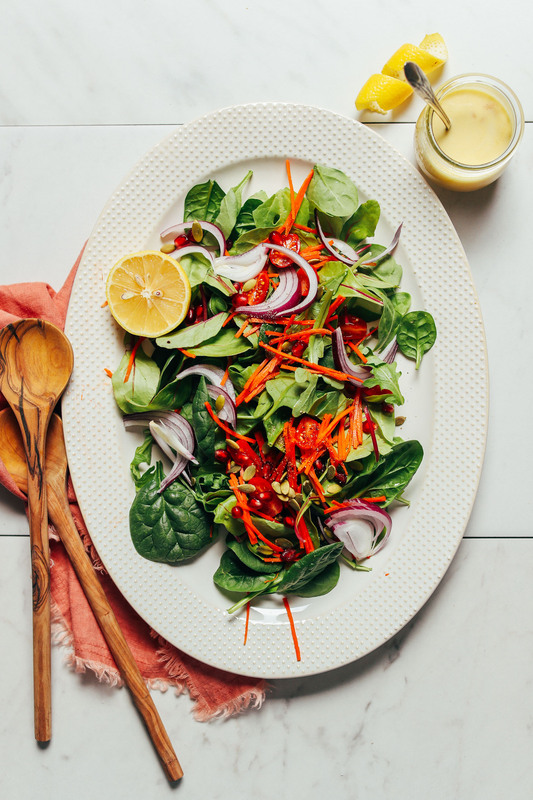 Fresh greens and vegetables dressed in a simple lemon vinaigrette pair with just about any meal. Ready in just 10 minutes. 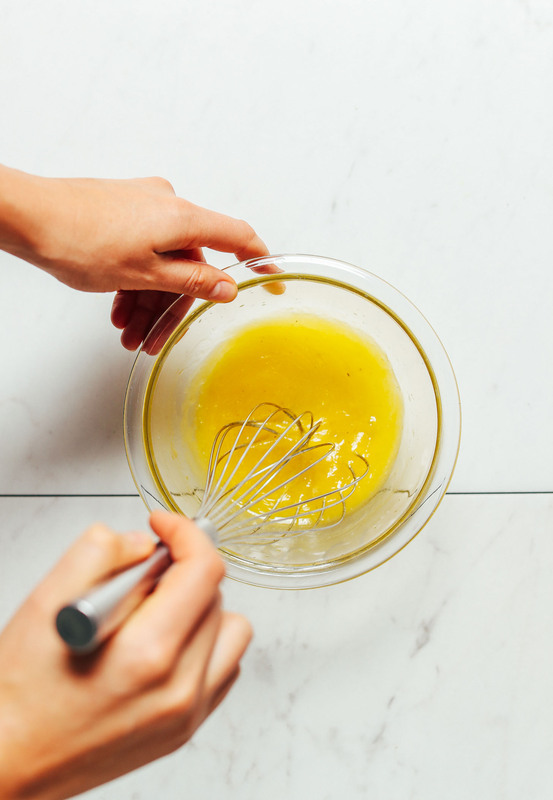 First prepare dressing by adding all ingredients to a mixing bowl (or small blender) and whisking (or blending) to fully combine. Taste and adjust flavor as needed, adding more maple syrup for sweetness, lemon for acidity, or salt or pepper to taste. Set aside. 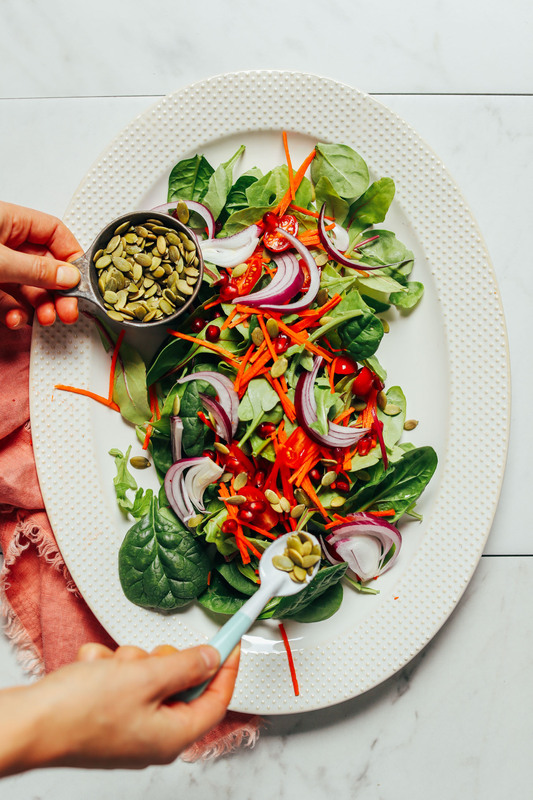 Prepare salad by adding greens to a serving bowl or platter and topping with baby tomatoes, shallot or onion, carrots, pomegranate arils or dried fruit (optional), a pinch of salt and pepper, and toasted pepitas or sunflower seeds. Add dressing to the salad and toss to coat, or serve on the side. Best when fresh. Store salad separate from dressing if keeping for later use. Will keep in the refrigerator up to 2-3 days. Store dressing in the refrigerator 3-4 days. The oil can harden when cold, so let set out for a few minutes to warm and shake well to reincorporate before serving leftovers. *Nutrition information is a rough estimate calculated with lesser amount of lemon juice and without optional ingredients. Perfect everyday dressing. Just what I was looking for. This is a really good simple recipe. As with the others who commented, adding the shallot and blending the dress is a great idea and makes a big difference! The dressing tastes so good. Thanks! I am in need of different types of Vinaigrette Dressings with no oil. I saw your tahini and ranch but I need Vinaigrette style. Trying to find something similar to Italian, Raspberry and Fig. Oops! I replied in the wrong place I think. I cook with no oil also. For vinaigrettes, try using flaxseed+water, or use 1-2 tbsp olive brine and the rest water. I love this as it brings in that olive taste! Such a great idea, using okive brine. Veggie broth works great, as well. Pacifica’s works nicely for dressings. One of my favorite salads with lemon vinaigrette uses shredded Brussels sprouts for the greens. They shred up so quickly with a knife and stay fresh a long time uncut in the fridge. They are nutritious and delicious! Love the blog! Blending shallots! Ingenious! I will definitely try this out! I like your flavorful recipes . I am interested in no oil ingredients especially for salad dressings. Hi Merry! Check out our Tahini and Ranch Dressings! I cook with no oil also. For vinaigrettes, try using flaxseed+water, or use 1-2 tbsp olive brine and the rest water. I love this as it brings in that olive taste! How long can you keep that dressing in the refrigerator? I make something similar with garlic and vinegar instead of shallots and lemon. This should be a nice fresh change. About 5-7 days! And shake well out of the refrigerator. I also like to let mine warm up in temperature a bit before serving as the olive oil can stiffen. Never thought of blending shallots for a salad dressing. Love this! Thanks so much and love from Germany!